Mike Genung took his first trip to Mainland China in 1986, when employed as Vice President for a distributor of machine tool products with more than 15 million in annual sales. He made purchases as a China sourcing agent from China and Taiwan for his employer, making overseas trips multiple times each year. Mike left the company in 1990, and started MG Trading and Development in 1991; the company was later renamed to Global Trade Specialists, Inc. in 1998. As GTS grew he created his own line of machine products, some of which were imported from China. This line was marketed to an international chain of distributors, and was eventually sold in 1998. 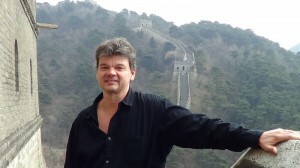 Over the years, Mike has made many buying trips to China (as well as Taiwan and Russia), and sales trips to Japan, Indonesia, Australia, Canada, various countries in Europe, and Israel. In his more than 25 years of importing and exporting experience as a China sourcing agent, he has faced many challenges, including taking part in the negotiation of the successful return and replacement of $100,000.00 worth of rusted gage pin gages for his former employer, and finding ways to consistently bring Eastern and Western business cultures together for mutually beneficial long-term relationships. Over the years, Mike has taken many new products from prototype to production for his customers (some that are patented) and helped them buy China direct; he enjoys helping his customers successfully bring new products to market. Mike strives to make integrity the foundation of his business. To read what some of his customers have to say about the way he helped them source their products China direct, see testimonials.